If your trusty steed falls from the position with the rubber side up paint may be the absolute least of your worries. I used to put mine upside down when changing a rear flat but then had issues with the chain coming off the chain ring. I now carefully lay it down on its non-drive side if no one is available to hold it for me. Every time I take my 9,5 kilogram carbon road bike out for a spin, I pack a 6,5 kg Park work stand and a 2 kg toolbox into a specially sewn, tubular canvas casing, sling it over my shoulder and bring that along for the ride. Problem solved. But seriously – as @Philip Mercer says: lay her gently down on the grass (or, even more gently, on pavement, if that cannot be avoided) with the drive side up. (I must admit at this point that it can be quite a challenge for someone as clumsy as yours truly, to successfully re-insert the rear wheel ‘with one hand’ while only having the other hand available to steady the machine. Front wheel = never a problem.) Clever tips, anyone? Umm – caption didn’t appear on the above. Anyway – point is what about the scenario in the picture? I avoided the Rule #49 violation but broke a bunch of others (which you’ll all be delighted to list). Will I burn in the deepest pit of hell being sodomised by Pharmstrong for eternity or are there mitigating factors to be taken into account? Could one of the more obvious violations be that your saddle is not horizontal? Hey there K.L. Sounds interesting – and I can actually almost see what he might be on about. Never tried it myself, but keeping a rear wheel fixed with one’s own two legs and then sort of bringing the bike back towards oneself… Could be. And I can even imagine developing just the right ‘slight-of-hand’ to make the chain sway sideways at exactly the right moment/amount to make it past the cassette. I’m always amazed – and hugely impressed – by how quickly pro mechanics can fit a new rear wheel into a road bike during races. They do seem to mess it up occasionally, but most of the time there’s Formula 1 grade expertise on display. OK – back to work – and to quietly rejoicing over Tom D’s masterful work in the Giro. 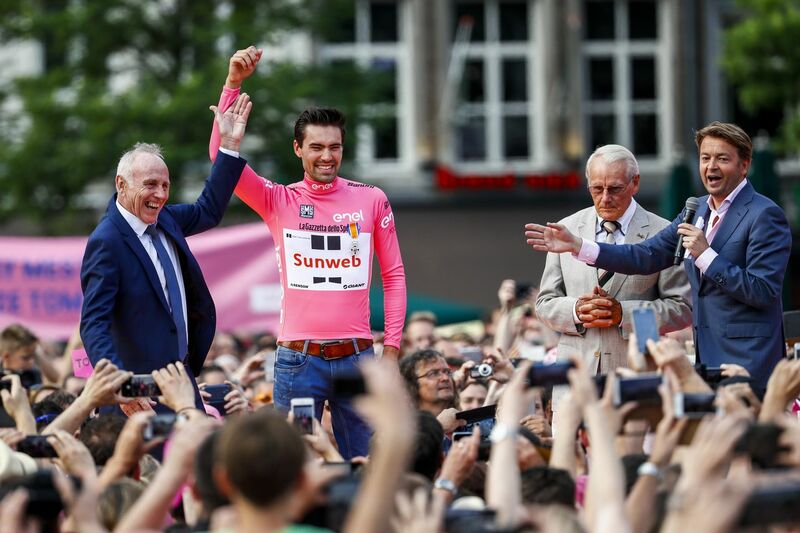 Dare we dream of (even more) good times ahead for Dutch cycling? If you can’t get the chain to sway, the way to do it and keep your hands clean is to push the rear mech down to slacken the chain, then slot the wheel in. Never touch the chain. I suspect that was a wee bit more than a 4 Hr ride……….. Already do that but there’s still some greasy dirt cropping up in the cages. Which messes with my clean white bartape. Which I do not like. So if anyone can figure out how Janssen does it, I’d be keen to emulate the pros! Funny you should say that. I’ve always been amazed at how poorly a lot of bike mechanics swap out wheels. I know the F1 teams practice like crazy to save just a few seconds on a pit stop., You’d think each year, pro team mechanics would go through some boot camp of switching out wheels. It should involve riders too – as it would certainly speed up the whole process if the rider, upon stopping for, say, a puncture, dropped the chain onto the smallest cog. Which means I must stop riding? Ha! You may well have exposed me as one who watches wáy too little pro cycling nowadays. (I try to convince myself that it’s because I’m ‘too busy’). I don’t have much (or any) evidence to support my claim – other than the fact that I have seen (or at least: I seem to remember having seen) pro mechanics switching rear wheels – and sending riders on their merry way again with a frantic push – in a matter of seconds. Conversely, I myself have been known, after puncture repairs, to fiddle with my rear wheel for what felt like minutes (and still not get it quite right sometimes, as I would discover upon re-mounting the bike). Maybe I’m just setting the bar pretty low. That’s an interesting picture. As a devote follower of Zoetemelk’s career, I can say that I have never seen Joop look so ecstatically happy in any photograph – not even those that document his own TdF win in 1980. As Krabbé said: few have taken the job of being a professional cyclist more seriously than Joop Zoetemelk. And wasn’t it until his 38th that he finally earned to wear the rainbowjersey? I can still remember the thrills in 1985from when I was young eventhough I wasn’t into cycling yet. And on the TdF: other riders have had more than 16 starts, but none has yet matched Zoetemelk’s record of actually completing the event 16 times. Totally class move inviting Zoetemelk and Janssen to the shindig. Joop’s WC was an awesome win – as was his compatriot Gerrie Knetemann’s win in the 1985 Amstel Gold race. I was apparently peeling onions during the latter race . . . . Knetemann was also world champ in 1978. Both Knetemann and Zoetemelk rode for TI-Raleigh too. Re Knetemann’s Gold Race: Yep – that was another memorable victory. And that time, it wasn’t so much the reporter(s), but Knetemann himself who cried his eyes out, if I remember correctly? Yes indeed. He was very much at the tail end of his career and riding for Skil-Sem. The weather was appallingly wet and rainy and Knetemann needed his gl;asses to see. I use my left shoulder to brace the saddle and lift the bike up and I have the wheel upright between my legs. It leaves my left hand to hold the rear stay and bring it back and over the cassette and the right hand to push the rear mech down. Then you just bring the frame down and release the mech and it sort of slots in. I think… it’s one of those things I just sort of do. I certainly don’t touch the chain – there’s often a bit of grease on the cage but it’s not much and just on thumb and forefinger usually. We’re way past the masturbation principle on that EPMS, my friend. Yes, lay ‘er down drive side up, resting on skewers, bar, and saddle edge. No frame paint ever touches the ground. Then just get used to snapping the wheel in under the chain, and into the frame. Doesn’t have to go in fully on the first try, once the wheel is close to the dropouts, you can let go of the frame and use both hands to slide it into place. Have just watched those two videos. Fantastic stuff. Cheers! Cheers. I’ll certainly give the shoulder-bracing trick that you describe a try, and experiment (read: muck about) with things until I can make it work. Like so many other things, it’ll probably require some practice. Reminds me that while ago @frank wrote an article about how to jump onto a cyclocross saddle. We need such detailed description in this case too. Or I will ask GCN to show it. Yeah that’s sort of what I do, except from behind and take the frame weight on my shoulder. I do the same thing. Except, being left handed, I put the saddle over my right shoulder, hold the wheel in the left hand, seat stay in the right hand. Works just fine. Well, unless it’s my MTB with disc brakes. Then there is much more fumbling and swearing trying to get things lined up. Come to think of it, I’ve done this so many times I have no idea how I do it. Will investigate and report back. Feels strangely like explaining how to hold a pencil. He’s Dutch. Everyone around him gets on his goddamned nerves irrespective of the reason, il-fitting clothes or otherwise. I keep Menchov’s 2009 Giro mechanic on retainer. Whenever I flat, that bugger hops out of a waiting car and changes out my wheel in 4 seconds (or at least that’s who I channel when I’m doing it myself). Correction: Or I will ask ErikdR to show it. As you know all Koga’s have this small chain hanger on the inside of the right rear stay and maybe I should stop using that. Will try!